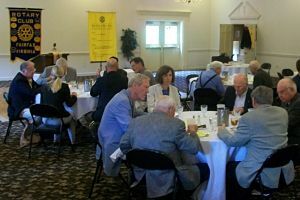 Rotary Club of Fairfax has a luncheon meeting. Earlier this week, I had the pleasure of speaking at the Rotary Club of Fairfax. As near as I can tell, Rotary is one of the most under-marketed organizations in the world. They do a tremendous amount of good work globally, but they are so busy eradicating polio, helping during global disasters, and fostering international understanding through exchange programs, they have little time to toot their own horn. 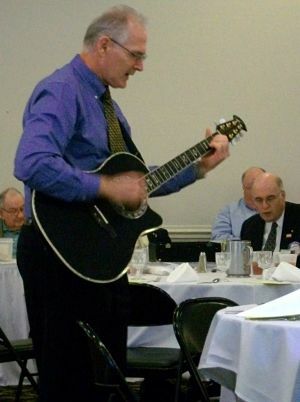 Rotarian John led the group in a song. After a hot meal, the Club heard from their Ambassadorial Scholar. This lucky student – courtesy of Rotary – is headed to study in Morocco. She was loaded up with goodies (e.g. Rotarian club banners … shirts) to share with the Rotary Clubs she will speak to while living and studying abroad. And of course, I spoke to the Club about auction fundraisers. They had a lot of questions, both about charity auctions and about auctions in general (of which I did my best to answer). As a side, I think if I work on them a little more, I’ve got a few future auctioneers in that crowd. Special thanks to Rotarian Brian who coordinated my visit.